The Mystery photo was taken at the Massapequa Lodge looking east to the Hicksville-Massapequa Road in what is now Plainedge. The toll lodge could be identified by its location in comparison with the Motor Parkway bridge in the background. A good second guess was the Bethpage Lodge. However, as noted by Frank Femenias, the Round Swamp Road Bridge, just east of the Bethpage Lodge, curved to the right in comparison with the Mystery Foto bridge. What is your best guess of the year of the photo? Provide a rationale. The photo/postcard was undated. According to my favorite co-author Al Velocci, the cedar posts seen in photo were replaced with concrete posts form 1921 to 1925. Based on other Motor Parkway postcard series, my best guess is the photo was taken around 1909. Kudos to Frank Femenias (see Femenias' Findings) and Tim Ivers for correctly identifying the Massapequa Lodge and the Hicksville-Massapequa Road Bridge in the Mystery Foto. The Mystery Foto was part of a Long Island Motor Parkway postcard series. It does not appear to be colorized. Bethpage Lodge, looking east over Round Swamp Road bridge. My first mystery photo guess…..let’s see! Great photo! If this is one of the original 6 John Russell Pope toll lodges (sort of looks like one), then two possibilities; the Bethpage Lodge facing east with Round Swamp Rd parkway bridge behind, or the Massapequa Lodge facing east with the Massapequa-Hicksville Rd parkway bridge behind. But the Round Swamp Rd bridge had a slight curve to the south, and its lodge was built halfway up the bridge, so this MUST be the Massapequa Lodge, home of Motor Parkway’s first police officer Thomas Zinzi, wife Josephine, and grandson Arthur Muriello. 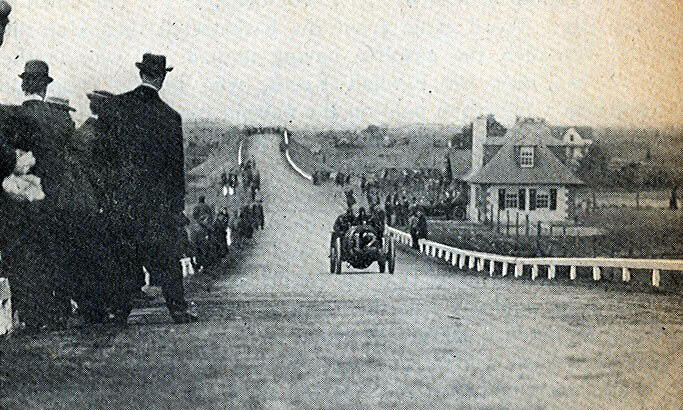 This lodge was nestled between two bridges (the other N Wantagh Ave) that placed it in the center of a wild roller coaster ride for the racers, then later for traveling motorists; a wake up call for Deadman’s Curve up ahead. I believe the photo was taken sometime after the LIMP closed in ’38, and the photographer’s location was at the end of the keyhole entrance, just before parkway access. Color may have been added more recently to a black and white photo. It appears the public still had access to the lodge but not the parkway. Howard, sending some pics. 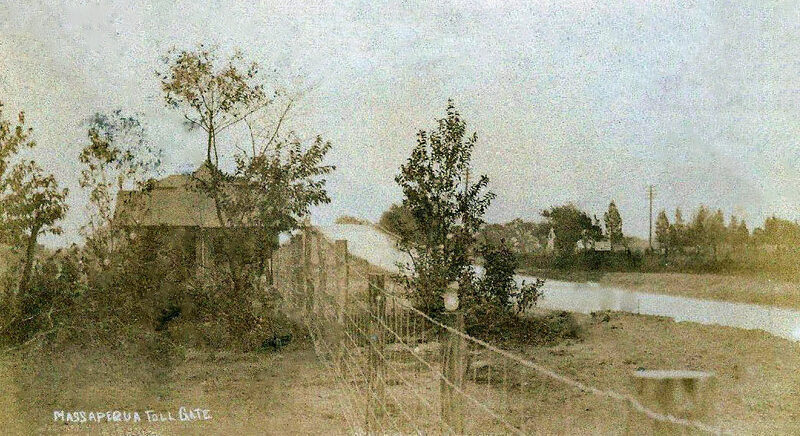 Looking east at the Massapequa Lodge on the left behind the shrubbery and the bridge over Hicksville Road (Route 107) about the year 1911. 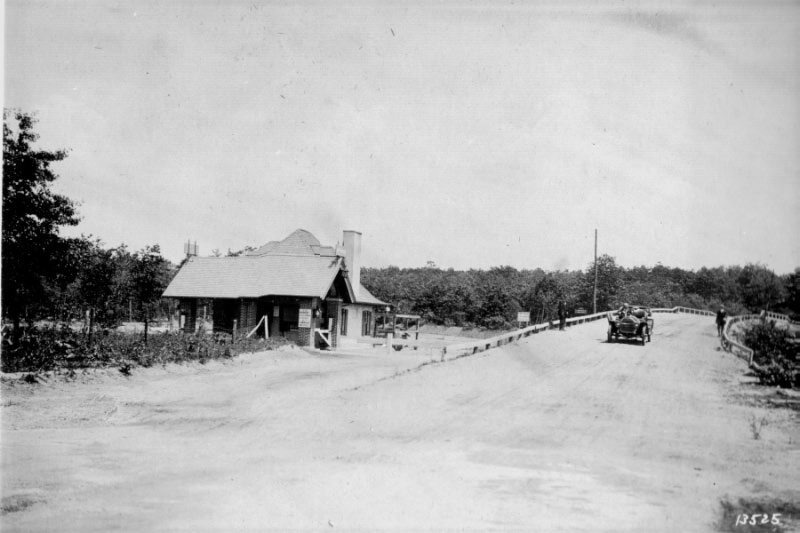 Bethpage Lodge looking east around 1915 because the parkway was not extended that far east until then. My guess: 1908 year opened as a toll road.